"It is not the color of the skin that makes the man, but it is the principles formed within the soul." "Alas, O God! Forgive me if I speak amiss; the minds of our tender babes are tainted as soon as they are born; they go astray, as it were, from the womb. Where is the maiden who will blush at vulgarity? And where is the youth who has written upon his manly brow a thirst for knowledge; whose ambitious mind soars above trifles, and longs for the time to come, when he shall redress the wrongs of his father and plead the cause of his brethren?" "When I consider how little improvement has been made the last eight years; the apparent cold and indifferent state of the children of God; how few have been hopefully brought to the knowledge of the truth as it is in Jesus; that our young men and maidens are fainting and drooping, as it were, by the way-side, for the want of knowledge; when I see how few care to distinguish themselves either in religious or moral improvement, and when I see the greater part of our community following the vain bubbles of life with so much eagerness, which will only prove to them like the serpent's sting upon the bed of death, I really think we are in as wretched and miserable a state as was the house of Israel in the days of Jeremiah." " I am of a strong opinion that the day on which we unite, heart and soul, and turn our attention to knowledge and improvement, that day the hissing and reproach among the nations of the earth against us will cease. And even those who now point at us with the finger of scorn, will aid and befriend us. It is of no use for us to sit with our hands folded, hanging our heads like bulrushes, lamenting our wretched condition; but let us make a mighty effort, and arise; and if no one will promote or respect us, let us promote and respect ourselves." 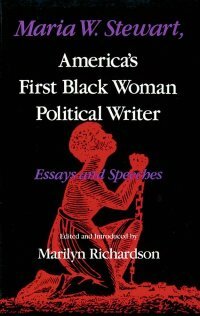 I know I have mentioned this phenomenal woman before, but last summer I had the opportunity to read "Maria W. Stewart: America's First Black Woman Political Writer" (1987), which is a compilation of her essays and speeches. Instead of outlining the man things she did throughout her life, and the significance those actions had back then and to this day (because doing so could take hours), I will keep with my usual pseudo book-review format and just touch on a few highlights, with the hope that you engage in further inquiry yourselves. Her first "political" lecture took place in Boston, Massachusetts in 1832 in the midst of a black and white crowd. Her focus during the lecture was on speaking out against the colonial movement, which sought to send Black Americans to West Africa for subjugation and oppression. In a nutshell, her lectures and writings (many of which were composed during her time as a writer for the abolitionist journal, "The Liberator") focused on two distinct, yet in her eyes related themes. The first theme was more pertinent to the social, political, and historical context of the times, and dealt with the abolition of slavery and the freedom of Blacks (domestically and abroad) from their white oppressors. If a woman running for president represents a huge step forward in the U.S. today, you could imagine the extent to which women (especially black women) were denied access to prominent, public-figure type leadership roles during the early and mid 19th century. It was also huge for her exert her ideas during a time when the "big names" in the abolitionist movement with regards to orators centered around a Black male, Fredrick Douglas. Both were intelligent and morally motivated (I think Fredrick Douglas was a Christian as well), and both were doing there thing. Unfortunately, however, she was not as "popular " amongst the public as Fredrick Douglas or other abolitionists for that matter. Potential reasons for her unpopularity will be discussed shortly. The second, and I would argue more controversial theme, that Stewart focused on was self-improvement through moral conduct and intellectual pursuit. One of her major textual references used in her speeches and writings was the bible. One of the books she to which she gave considerable attention was the Book of Jeremiah, as she likened the condition of the Israelites during that time to the state of Americans during her time. In essence, she believed that while Blacks had to demand and thus deserved their human rights from their white professors, they could not afford to do so passively. Namely, they could not sit back and wait for social change to happen. Instead, they had to continually work to change them selves, morally by living a life pleasing to God and intellectually and embracing education and the expansion of the mind. By doing these things on an individual level, she believed, social change must follow suit. As with anyone who touches on topics which make audience members feel convicted in one way or another, she had difficulty garnering support and was often criticized and ostracized by those she was advocating for. Come to think of it, this may be why she like book of Jeremiah, as he was undoubtedly ostracized and criticized as well. This is not to say that he had no followers or made no "real" impact. Her lectures and writings have inspired many different people, and her work as a teacher in New York once she left Boston most assuredly impacted her students' lives in a positive way. Always glad to see Stewart still touching people's lives. Mos def, she's awesome. Too bad she doesn't get as much pub as other historical figures. Thanks for the love.